Delivering SmartSequencing outside of the equipment rack, with remote relay. 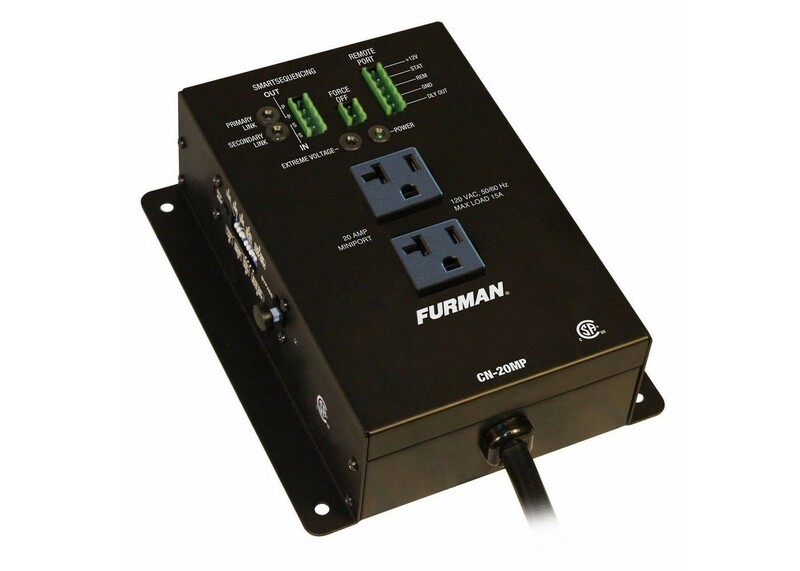 Furman’s Contractor Series MiniPorts extend the benefits of SmartSequencing to electronics outside of the equipment rack, providing tremendous flexibility to any installation scenario. Units may be daisy-chained and fully controlled via a Furman SmartSequencer, legacy Furman sequencer, third-party sequencers, via the Internet (with BB-RS232 adaptor and SmartSequencer), and/or control and automation systems. DIP switches and potentiometer allows customization of settings such as sequencing delays, 12V on/off, and more. Security covers are provided to prevent unauthorized personnel from tampering with DIP switches. Sequencing of duplex initiated remotely by standard analog triggering (remote terminal) or data link (SmartSequencing from CN-1800S or CN-2400S). The CN-20MP can shut itself off automatically when triggered by a fire alarm. • Voltage Protection - Extreme Voltage Shutdown (EVS) safeguards from catastrophic under-voltage (under 80V sustained) or over-voltage (over 145V sustained) conditions. The EVS feature can be selectively enabled or disabled according to the preference of the user. • BlueBOLT Compatible® - IP Control (Telnet or cloud-based BlueBOLT) via SmartSequencing (when connected to CN-1800S/CN-2400S with BB-RS232 Adaptor). • Diagnostic Lights - Diagnostic lights provide valuable system information including power quality. • 20 Amp Output Current - 20 amp maximum current capacity. • DIP Switch Customization - DIP switches and potentiometer allows customization of settings such as sequencing delays, 12V on/off, and more. Security covers are provided to prevent unauthorized personnel from tampering with DIP switches.